Dances with Wolves is the original soundtrack of the 1990 Academy Award and Golden Globe winning film Dances with Wolves produced, directed, and starring Kevin Costner. The original score and songs were composed and conducted by John Barry. 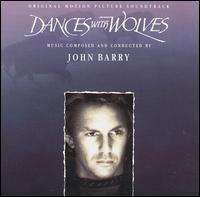 John Barry won the 1991 Academy Award for Best Original Score and the 1992 Grammy Award for "Best Instrumental Composition Written for a Motion Picture or for Television." Barry was also nominated for the 1991 Golden Globe Award for Best Original Score (lost to the score of The Sheltering Sky) and the 1992 BAFTA Award for Best Film Music (lost to the score of Cyrano de Bergerac).